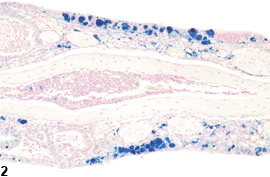 Nose, Respiratory epithelium - Pigment in a female B6C3F1/N mouse from a subchronic study. The mucosa and lamina propria of the turbinate contain pigment deposits. 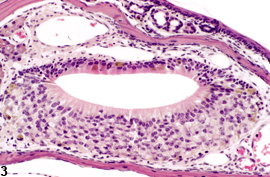 Nose, Respiratory epithelium - Pigment in a female B6C3F1/N mouse from a subchronic study (same animal as in Figure 1). The pigment in the turbinate is positive by the Prussian blue method (i.e., iron). 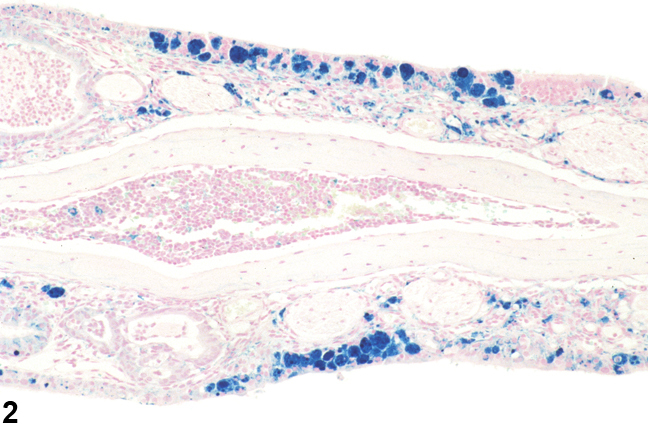 Nose, Vomeronasal organ - Pigment in a female B6C3F1/N mouse from a subchronic study. 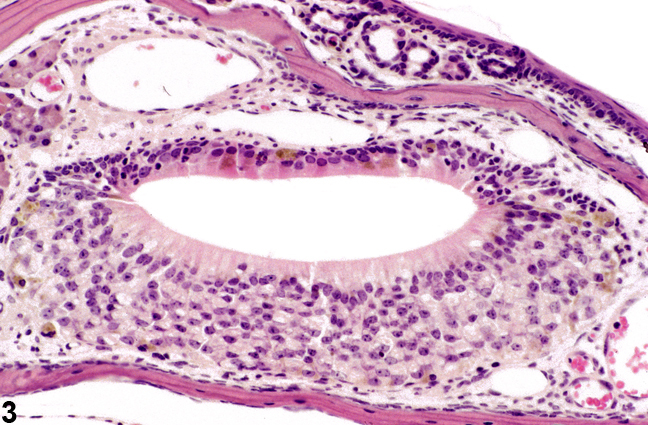 There is golden brown pigment in epithelial and glandular cells of the vomeronasal organ. 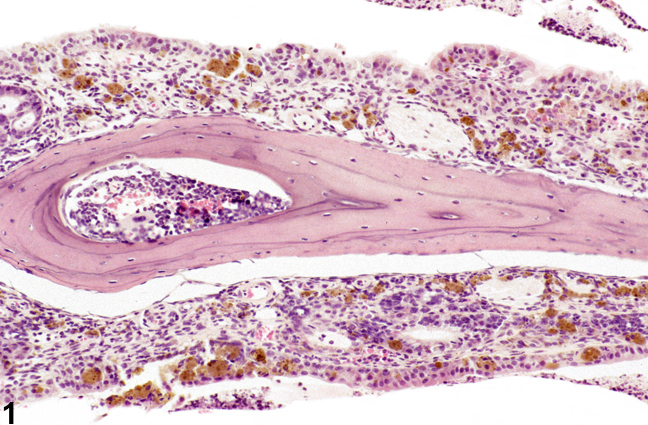 Nose, Vomeronasal organ - Pigment in a female B6C3F1/N mouse from a subchronic study. 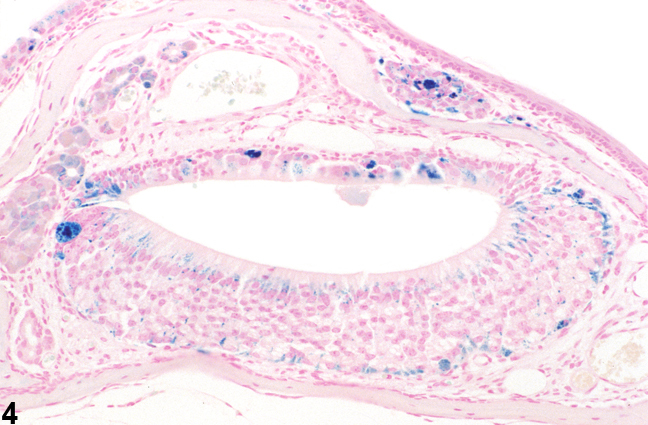 The pigment in the vomeronasal organ is positive by the Prussian blue method (i.e., iron). Pigment is most commonly seen in the epithelium lining the nasal cavity and the subjacent lamina propria ( Figure 1 and Figure 2 ) but can occur anywhere in the nasal cavity, including the vomeronasal organ ( Figure 3 and Figure 4 ). Pigment accumulation can be secondary to a number of pathologic processes, including inflammation, degeneration, or hemorrhage, and its chemical composition can vary. Pigment often contains iron, which can be demonstrated by the Prussian blue staining method ( Figure 2 and Figure 4 ). Pigmented material may be seen in the nasal cavity due to accumulation of the test agent in the tissues, in which case it may cause necrosis, inflammation, respiratory metaplasia, epithelial regeneration, and other lesions. If the material is seen only in treated animals and is absent from controls, and the amount of material increases with exposure concentration, this suggests that the material is the test agent. Pigment should be diagnosed whenever present and assigned a severity grade. 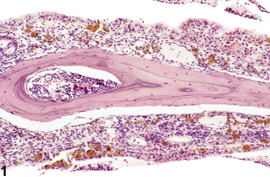 The location of the pigment should be indicated by including a site modifier in the diagnosis (e.g., respiratory or olfactory epithelium, vomeronasal organ). Since definitive pigment identification is often difficult in histologic sections, even with a battery of special stains, a diagnosis of "pigment" (as opposed to diagnosing the type of pigment, e.g., hemosiderin or lipofuscin) is most appropriate. The morphologic features of the pigment should be described in the pathology narrative. Not all pigments should be diagnosed, as some are ubiquitous in aging animals or related to some other disease process and not toxicologically meaningful. The pathologist should use his or her judgment in deciding whether secondary deposits of pigment are prominent enough to warrant a separate diagnosis. When the pathologist is confident that the pigment represents accumulation of the test article, it should be diagnosed as foreign material (see Nose - Foreign Material). Nikula KJ, Sun JD, Barr EB, Bechtold WE, Haley PJ, Benson JM, Eidson AF, Burt DG, Dahl AR, RF Henderson RF, Chang IY, Mauderly JL, Dieter MP, Hobbs CH. 1993. Thirteen-week, repeated inhalation exposure of F344/N rats and B6C3F1 mice to ferrocene. Fundam Appl Toxicol 21:127-139.